Courtney Alexander is research director for the Culinary Workers Union Local 226. Jay Brigham is a staff historian with Morgan Angel Associates in Washington, D.C.
Jon Christensen is a freelance investigative reporter and writer based in Carson City, Nevada. Mike Davis is professor of history at the State University of New York, Stony Brook, and the author of Ecology of Fear: Los Angeles and the Imagination of Disaster. Constance Devereaux is a freelance writer and artist in Southern California. Brian Frehner is completing his doctoral degree at the University of Oklahoma. Peter Goin is professor of art at the University of Nevada, Reno. Joanne L. Goodwin is associate professor of history at the University of Nevada, Las Vegas. Kathryn Hausbeck is assistant professor of sociology at the University of Nevada, Las Vegas. Norman M. Klein teaches at the California Institute of the Arts, Los Angeles. Shannon McMackin is a native of Las Vegas. Francisco Menendez is associate professor of film and the director of film studies at the University of Nevada, Las Vegas. Kit Miller is a freelance writer and photographer in Carson City, Nevada. Richard Misrach is a professional photographer in Emeryville, California. Eugene Moehring is professor of history at the University of Nevada, Las Vegas. Robert E. Parker is professor of sociology at the University of Nevada, Las Vegas. Hal Rothman is professor of history at the University of Nevada, Las Vegas, and the author of Devil's Bargains: Tourism in the Twentieth-Century American West and Neon Metropolis: How Las Vegas Started the Twenty-first Century. William N. Thompson is professor of public administration at the University of Nevada, Las Vegas. Amie Williams is a filmmaker and the principal of Balmaiden Films. 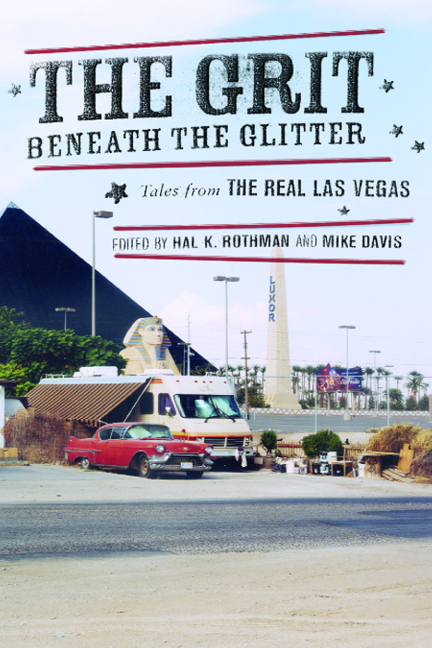 The Grit Beneath the Glitter is the first real look at the new Las Vegas from the inside. In it, long-time residents as well as professionals reflect on the transformation of one of the fastest-growing and most famous cities on earth, yet one about which relatively little is known. They offer a lively and compelling portrait of the other side of Las Vegas: the people and institutions that support the glitter of the gaming and entertainment industry. Examining a range of topics--from the city's commercial history, labor conditions, and environmental problems to an analysis of the famous lights of the Strip--the contributors uncover the contradictions between the illusion and the reality of the city, the seam between fantasy and the life it masks. The essays in this collection explore the world that employees experience when they enter gaming palaces from an employee entrance in a back parking lot rather than through the scripted doors of casino/hotel palaces. They take readers into the neighborhoods where 1.4 million Americans now live, attend school, eat dinner, and go to work.